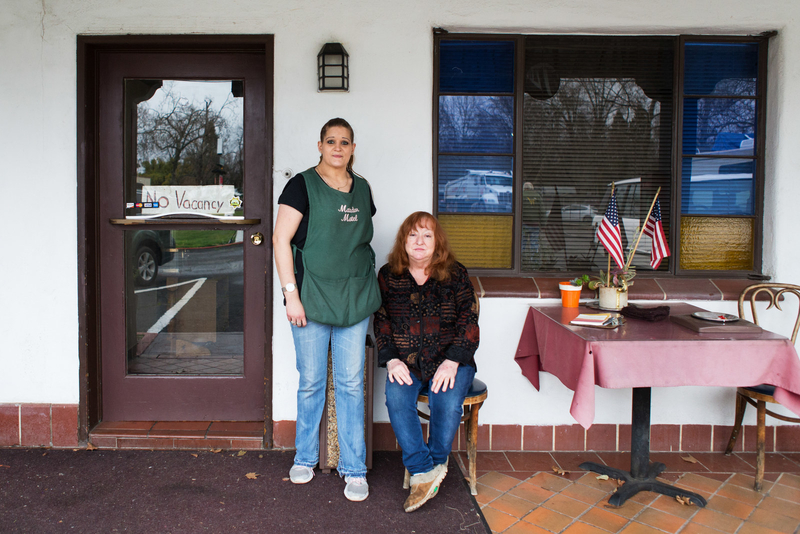 Irene White, owner of the Matador Motel, and Krista Clatterbuck, an employee of the motel, outside the front entrance of the motel in Chico, California. CHICO, California — The effects of the Camp fire in Paradise, California are still prominent and devastating, four months after the fire was extinguished. While the campers at Walmart have long since cleared out, local motels are still full of people affected by the fire as residents search for stability and clarity amid delayed insurance payouts and patchy FEMA support. At least one local motel was completely booked with utility workers. Another had been renting out over half of its rooms to citizens displaced by the fire. 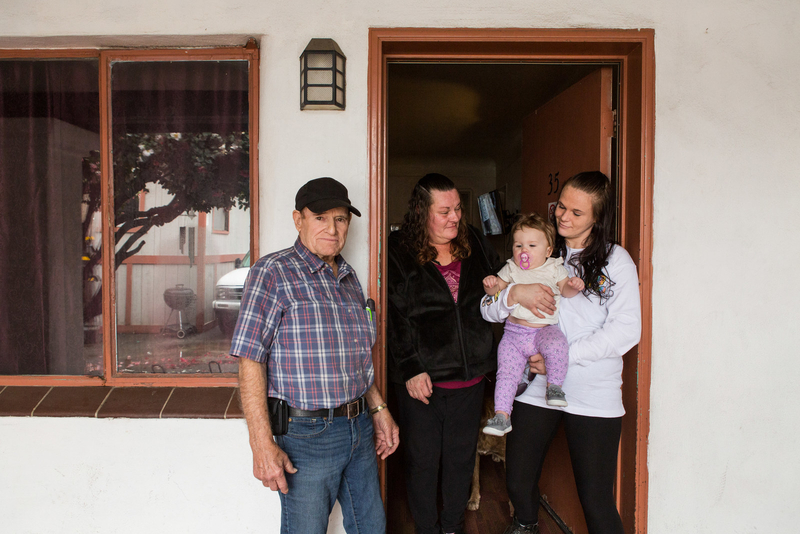 Jim McLaughlin, 83, stands in front of his motel room he has been living in for two months with his granddaughter Rebecca McLaughlin, his niece Kim McLaughlin, and his great granddaughter, Mackynzie, at the Matador Motel in Chico, California. Jim lost his home in Paradise, where he had lived for 59 years, in the Camp fire, including all of his family photographs and poems he wrote. Unable to find a house in nearby Chico, where he can be close to his family and grandchildren, Jim has been living in the Matador Motel. He’s unsure where he’ll go next if he can’t find a home in Chico. Peters lost her home in Paradise and everything in it. 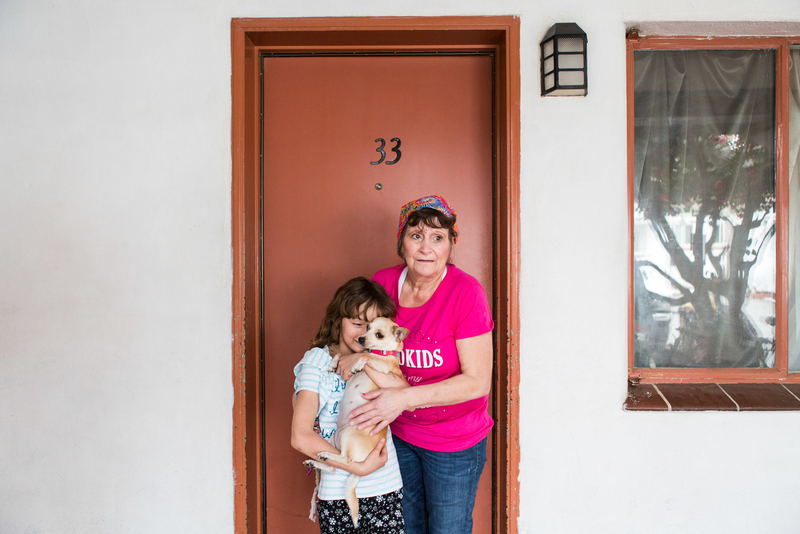 Peters, her daughter and two granddaughters have been living in a room at the Matador Motel for four months and still do not know where they will go next. 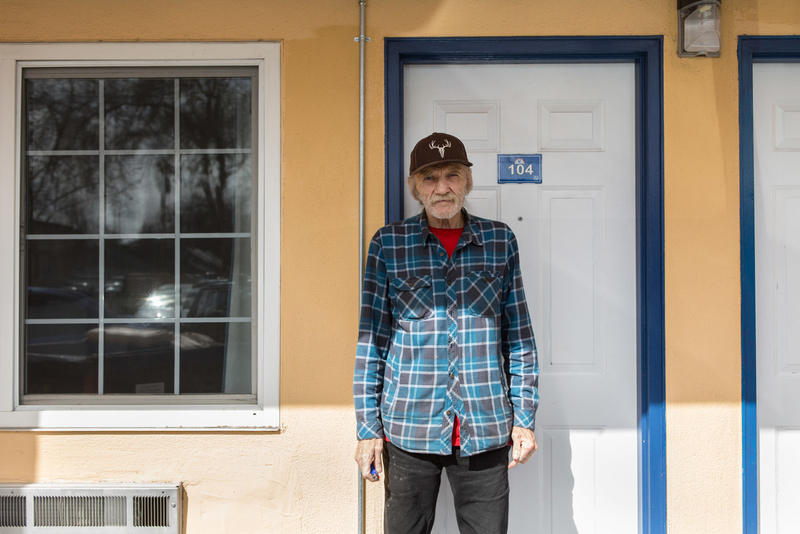 Gary Francisco, 74, stands outside one of the rooms at America’s Best Value Inn in Chico. Francisco, who lived in Paradise for 25 years, lost his motor home in the Camp fire. 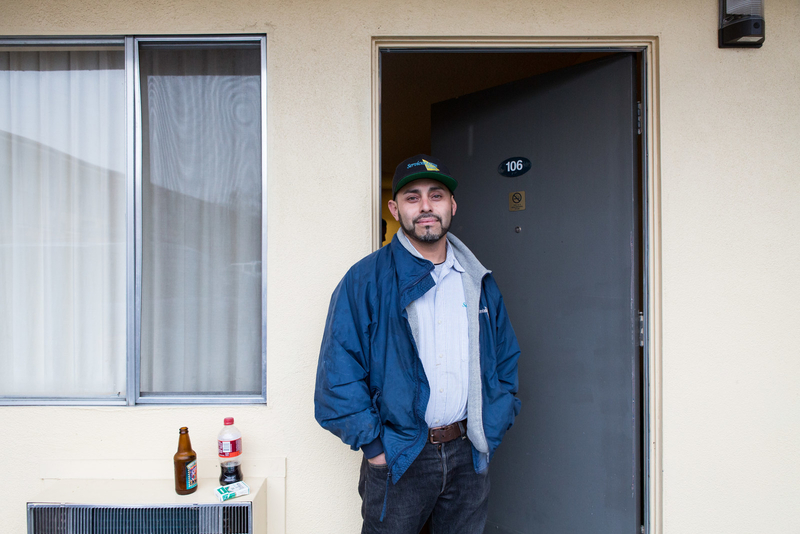 Francisco has been staying at the motel for four nights after he was forced to leave another inn that he lived in for three months. He’s not sure where he will go next. Lopez lost everything they owned except a few items she saved in her purse. 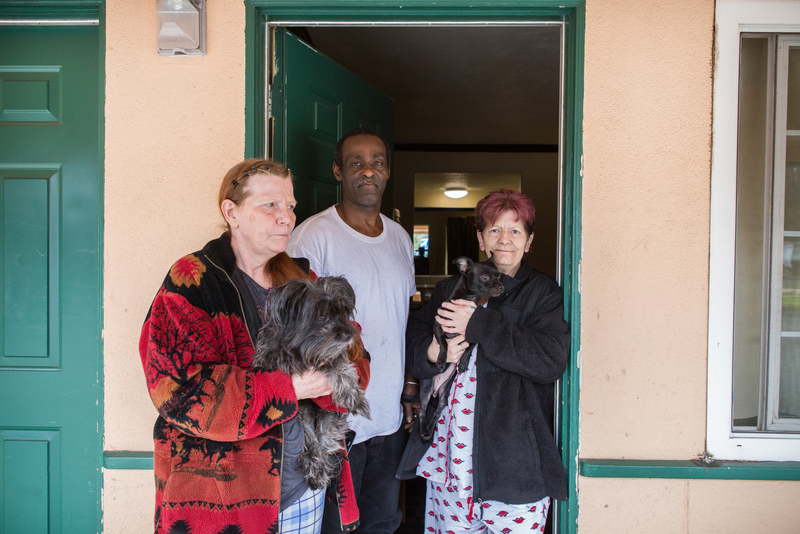 Since they had home owner’s insurance, they haven’t received any help from FEMA and have had to pay for their motel room with insurance funds, which are running out. Lopez and her husband hope to move into an RV once their daughter graduates from California State University, Chico in May. 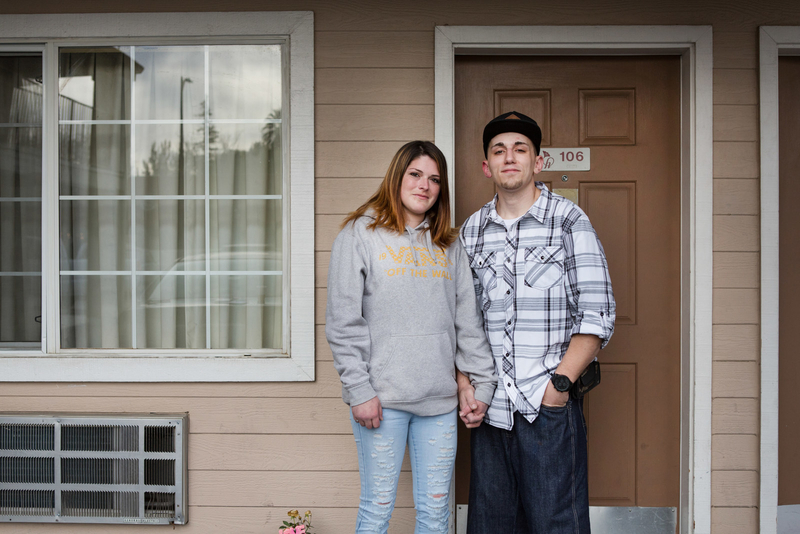 The couple has lived in eight motels since the Camp fire destroyed Coleman’s home that she had just finished paying off after it was passed down to her by her family. Coleman said she lost all documentation for the house in the flames and is trying to figure out how to claim her property. The pair are unsure where they will live next. 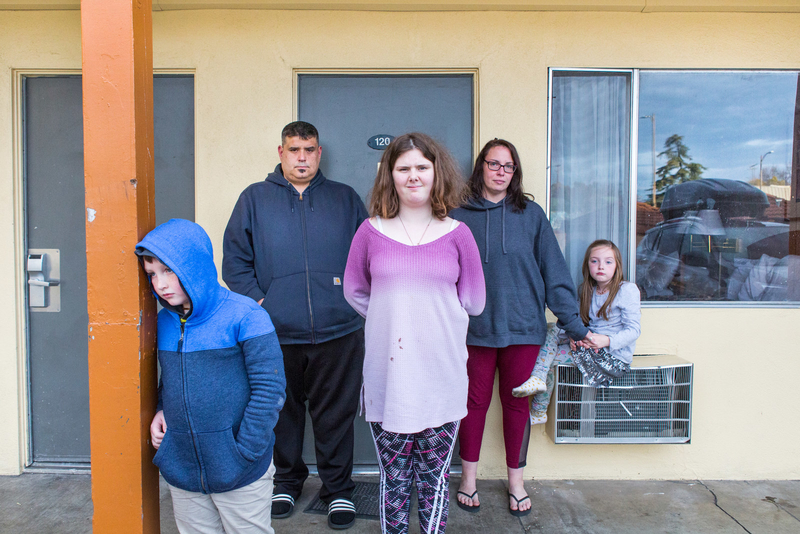 Holly Ratliff, her partner Josh Moore, and Holly’s three children, Mariah Ratliff, 14, Micah Ratliff, 9, and Maisie Ratliff, 6, stand in front of the University Inn motel where they have been living for a month. Holly lost her house, two cats and dogs, and the four other homes she grew up in to the Camp fire. Her family relies on FEMA to help pay for their motel stay and has had to changes rooms several times because of the limited coverage provided. They don’t know where they will move next until FEMA provides them with additional information. 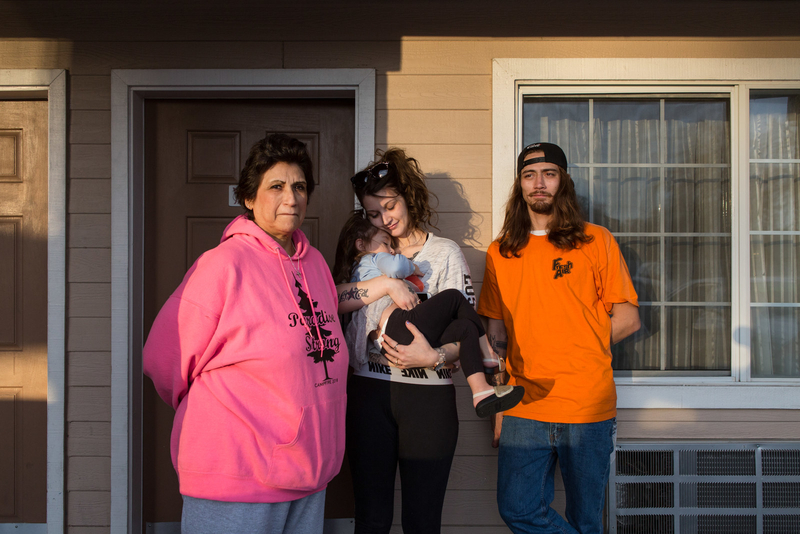 Edna Valdez, 70, with her grandson, Andrew Earhart, 25, granddaughter, Kelsi Earhart, 22, and great-granddaughter, Isabelle, 2, in front of the Heritage Inn Express motel room where they’ve been staying for two days. Valdez and her family have lived in more than 24 motel rooms since the fire destroyed their home in Paradise where she lived for 42 years. Andrew Earhart lost the trailer he had been living in to the fire. Valdez said she plans to move into a longer term rental an hour away in Yuba City. 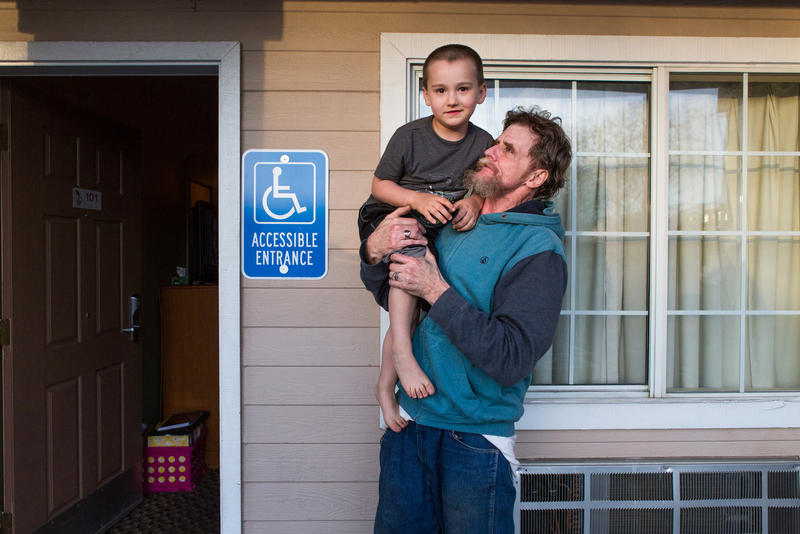 Hyden Seaman, 5, and his grandfather Steven Hyde stand outside their motel room at the Heritage Inn Express. 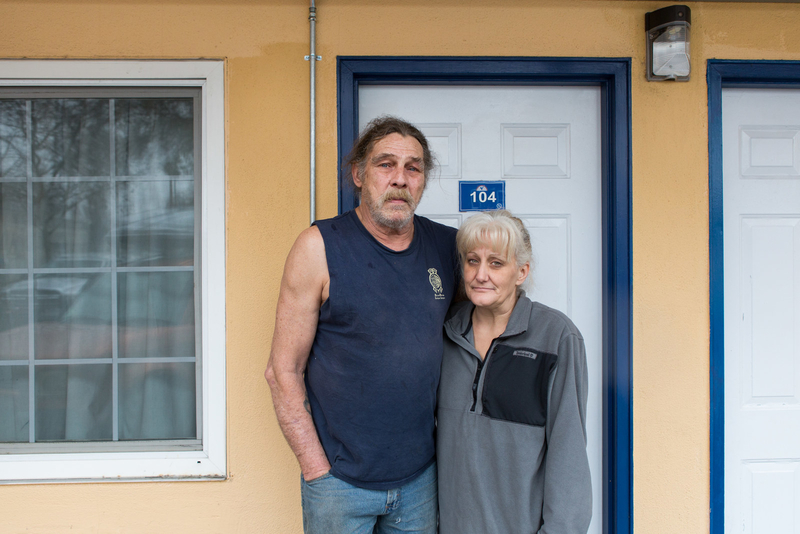 Terry Seaman and his partner Linda Miller stand outside their motel room at the Heritage Inn Express where they have been living for months with their son, Hyden. Before the fire, Seaman was diagnosed with leukemia and Miller was in a car accident causing serious injury to her leg and foot, making their situation particularly difficult. Three crewmembers from Service Master Clean stand in front of a room at the University Inn where they’ve been living for four months. The company specializes in fire restoration after major disasters like the Camp fire. 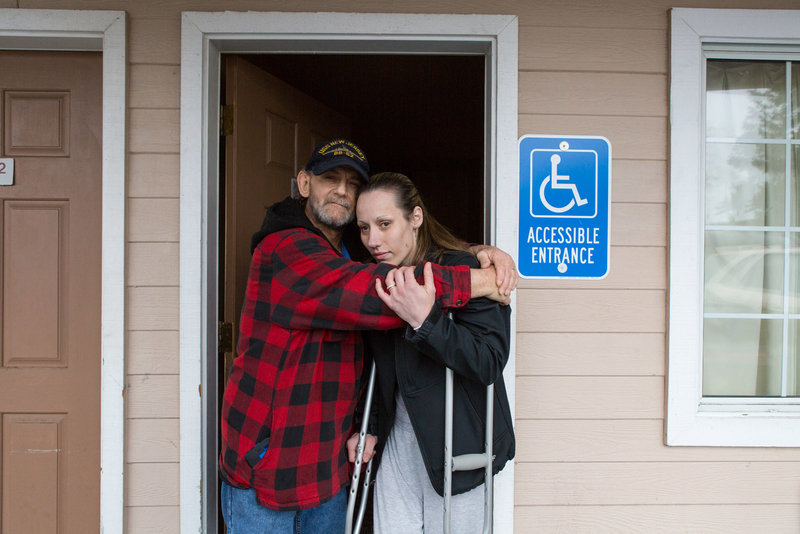 Tiffany Garrison, 50, and her partner David Sexton, 62, stand outside the motel where Garrison has been living for nearly four months. Garrison said she lived in Paradise since she was four-years-old and lost everything she owned in the fire. She is holding onto hope she won’t have to leave Chico since her family lives in the area, but if she cannot find housing, may move to Idaho. 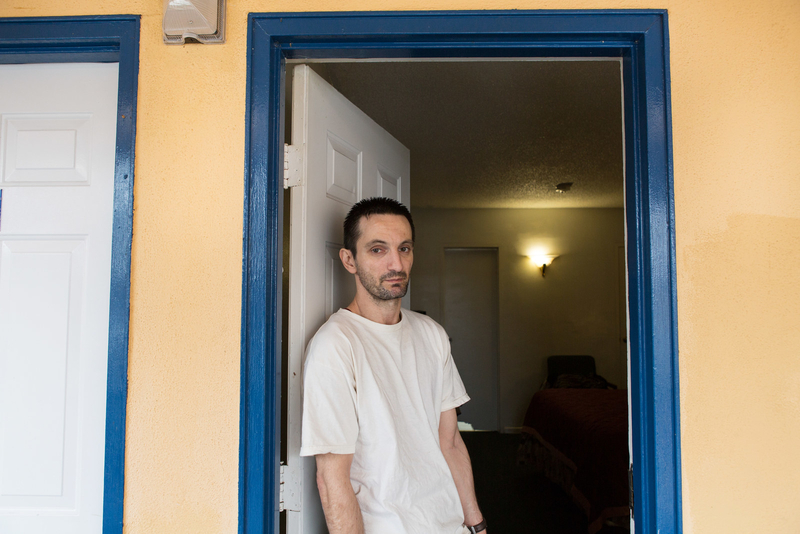 Liviu Bujor stands in the doorway of his room at America’s Best Value Inn. Bujor lost the cottage that he had been renting in Paradise for five years, along with his birth certificate, musical equipment, and photographs from his life in Armenia. Bujor has been living in the motel since the fire and when FEMA can’t provide assistance, he sleeps in his car. 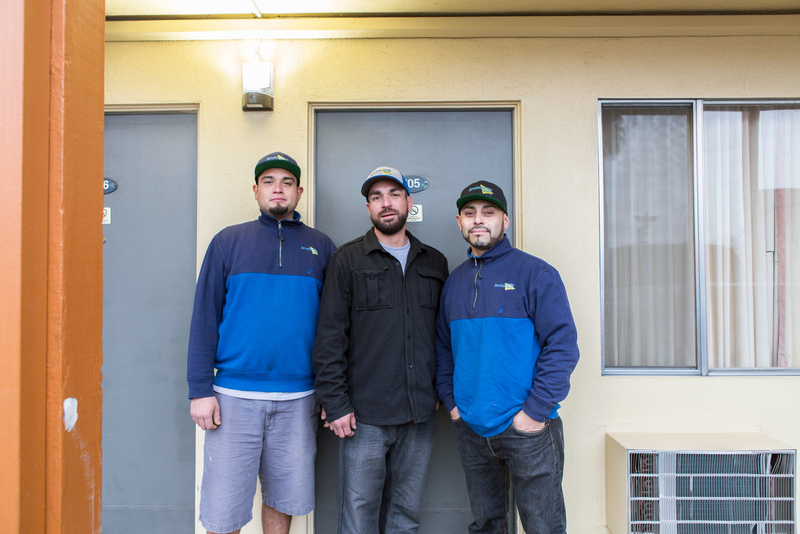 Alex Rojas stands in front of his room at the University Inn where he’s been living for four months along with the rest of his crew from their company, Service Master Clean, that specializes in fire restoration after major disasters like the Camp fire in Paradise. After losing their home in the fire, the family moved into a friend’s apartment with 13 other people for a period of four months. 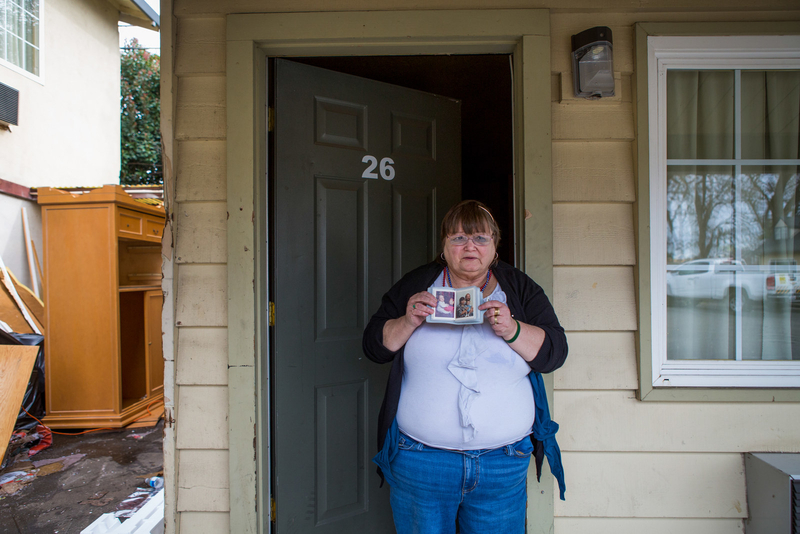 The Valencics lost their dog, childhood keepsakes, and a family member’s ashes in the fire. 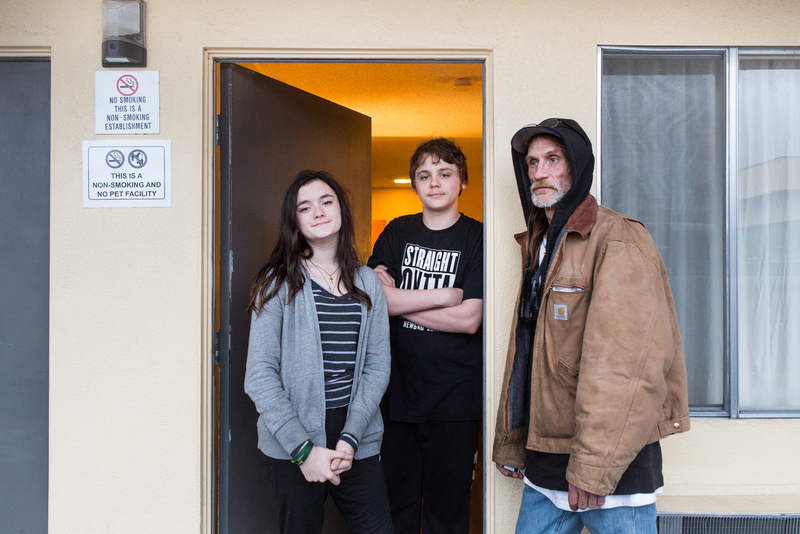 For now, the family plans to stay in the motel as long as there is availability and a way to pay for it. The Valencics hope to move into an RV in the future. 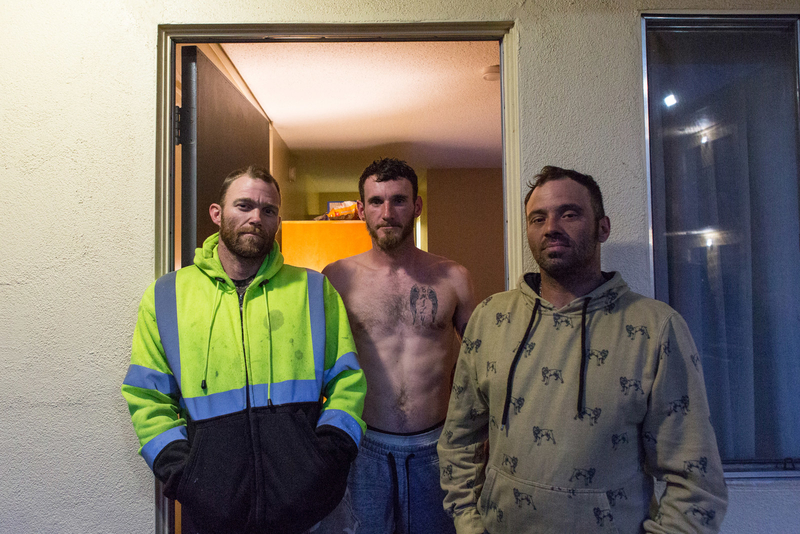 Workers Brad Bailey, 40, Joe Newberry, 32, and Layton Perkins, 32, stand outside a motel room they’ve been living in for more than two months while they clear away hazardous tree debris in Paradise left by the wildfire.